Looking to escape the pressures of being Henry Fords only son and thus, sole heir to the Ford Motor Company, Edsel Ford began purchasing the hilly property in northwest Oakland County in 1923 and the following year had broken ground on his rural estate. In 1976, Haven Hill was registered as a National Natural Landmark by the National Park Service, one of only 12 in Michigan. 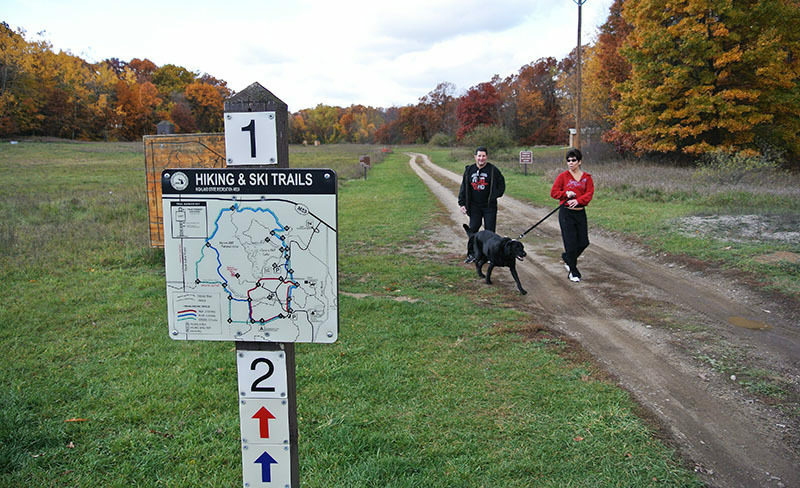 This combination of history and nature in a setting accessible mostly by trails makes Haven Hill unique and one of the most interesting destinations in southern Michigan for day hikers and history buffs. Looking to escape the pressures of being Henry Ford’s only son and thus, sole heir to the Ford Motor Company, Edsel Ford began purchasing the hilly property in northwest Oakland County in 1923 and the following year had broken ground on his rural estate. He chose the area because it contained one of the county’s highest points, a 1,134-foot high ridge known as Heaven Hill. Ford renamed it Haven Hill, reflecting the sanctuary that the auto magnate had sought. By 1931 Ford had completed his 6,900-square foot hilltop lodge and surrounded it with such amenities as a pool, clay tennis courts, a horse-riding stable, a working farm, trails through woods and a quarter-mile-long toboggan run with a motorized tow rope. Ford and his wife raised their four children at Haven Hill, using the retreat until his death in 1943. Three years later Eleanor Ford sold the estate to the state Michigan and eventually Haven Hill became part of the Highland Recreation Area, a 5,903-acre state park unit created in 1972. The buildings and ruins from the Ford estate lead to Haven Hill being named a state historic site. But the 721-acre tract — that has remained largely undisturbed for the past 75 years — was also designated as a natural area because it contains every principal forest type in southern Michigan, including cedar and tamarack swamps, beech-maple forests and oak-hickory forests. 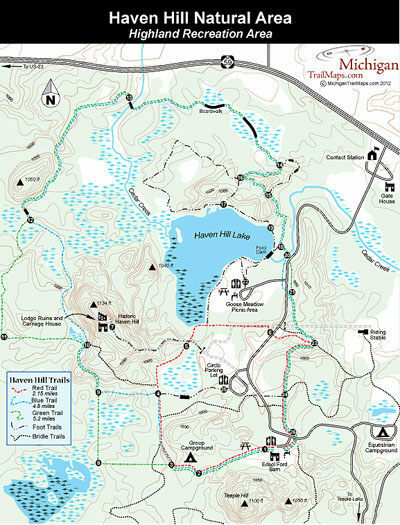 In 1976, Haven Hill was registered as a National Natural Landmark by the National Park Service, one of only 12 in Michigan. 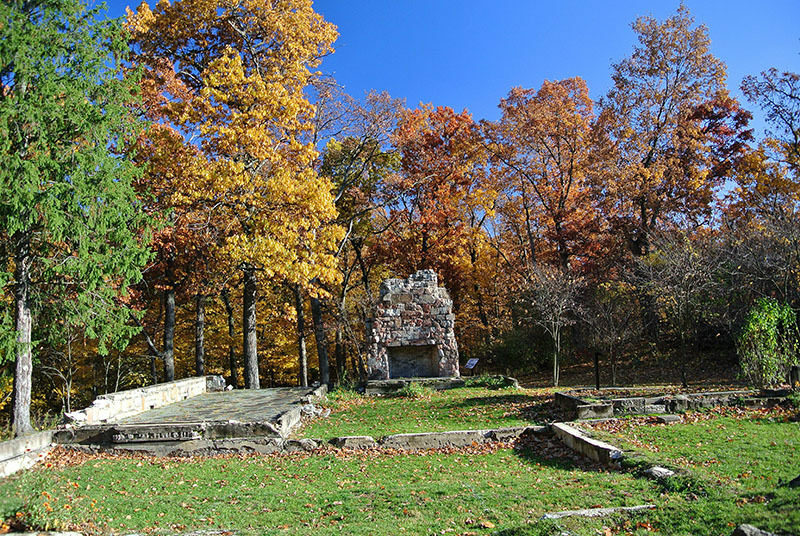 This combination of history and nature in a setting accessible mostly by trails makes Haven Hill unique and one of the most interesting destinations in southern Michigan for day hikers and history buffs. Most of the hiking in Highland Recreation Area, roughly nine miles of trail, is located in Haven Hill, which represents about a third of Ford’s original 2,400-acre estate. One of the most popular hikes is the Blue Trail, a 4.8-mile loop that at times leaves you’re somewhere up north, not in one of Michigan’s most developed counties. For those intrigued by the Ford history, there’s Historic Haven Hill, a 1.4-mile round trip hike from Circle Parking Lot along the former entrance drive (now closed to traffic). The park also features one of the most challenging mountain bike trail systems in southern Michigan. The 15-mile network is composed of four loops and accessed from a trailhead on Livingston Road south of M-59 via Duck Lake Road. Loop D, which includes climbing 1,120-foot Mount Omich, is often called the "hardest 4 miles of mountain biking in Michigan."